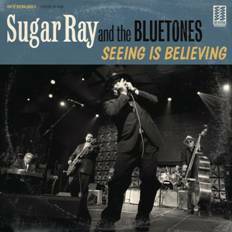 ANNAPOLIS, MD – Severn Records announces an October 7 release date for Seeing Is Believing, the new CD from the acclaimed Sugar Ray & the Bluetones. Seeing Is Believing is the band’s seventh album for Severn Records and follows their highly-successful 2014 CD, Living Tear to Tear, which garnered them seven Blues Music Award nominations, including “Best Band,” plus individual nominations for Sugar Ray as “Traditional Male Blues Artist” and “Instrumentalist – Harmonica,” and a song nomination for “Things Could Be Worse.” At the most-recent Blues Music Awards in May, the group was again nominated for “Band of the Year,” as well as individual nominations for keyboardist Anthony Geraci, guitarist Monster Mike Welch and bassist Michael Mudcat Ward. Anthony Geraci’s album with The Boston Blues-All-Stars, Fifty Shades of Blue, received three additional nominations. Produced by the band, the dozen tracks on Seeing Is Believing – 11 originals and a scintillating instrumental cover of B.B. King’s “You Know I Love You” – sweep out of the speakers with the power of a gale force wind, blowing with a transcendent groove. The band: Sugar Ray Norcia on lead vocals and harmonica, Monster Mike Welch on guitars, Anthony Geraci on pianos and Hammond organ, Michael Mudcat Ward on bass and Neil Gouvin on drums, never wastes any notes. From the opening Mississippi blues of “Sweet Baby,” that features Norcia's down-and-dirty harmonica and his signature blues growl, and the wink-and-a-nod jazz blues of “Misses Blues,” to the smoky lounge tune, “Not Me,” Sugar Ray and the Bluetones wring out every emotion, demonstrating just how blues ought to be played. “We do this to have fun,” laughs Sugar Ray. “Every time we go into the studio or out on a road trip or onstage, we always say ‘let’s have some fun’.” It’s that spirit of keeping it loose and playing for the fun of it and simply letting the music carry them wherever it will that keeps Sugar Ray & the Bluetones burning up the musical landscape. As the band sings on the song, “Blind Date,” written by Norcia, “if you ain't having fun/you're doing something wrong.” Each player’s ability to step right up and plug right into the groove with his own musical vision for the song creates the overarching unity of the band’s music. That musical oneness also grows out of the Bluetones’ time together. They just celebrated 35 years as a band. Monster Mike Welch is the “youngster” of the band, since he’s only been with the Bluetones for 16 years. Over those years, the band has put out many critically-acclaimed albums and garnered high honors; this past April, Sugar Ray & the Bluetones were inducted into the Rhode Island Music Hall of Fame. In 2014, Sugar Ray received his third Grammy nomination (“Best Blues Album”) for his playing on Remembering Little Walter. On Seeing is Believing, as on all their albums and at their shows, Sugar Ray & the Bluetones are having fun—and so will anyone who listens to any song on this new album—but they’re also paying homage to this “beautiful, wonderful genre of music.” This new album itself is a work of beauty and wonder, indeed, both paying tribute to the music of everyone from Muddy Waters, Otis Spann, and Little Walter to Louis Jourdan and Louis Armstrong. The sound is that big and that tight.